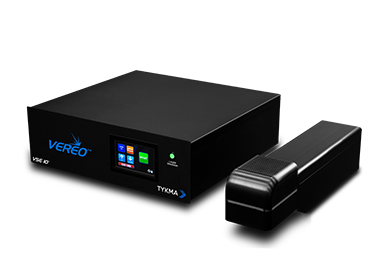 Our Vereo™ Fiber Laser offers the latest, most advanced features for manufacturers and integrators seeking an OEM laser for their project. A MOPA based fiber engine allows for high peak power, fast processing times and maximum application flexibility. This system is air-cooled and maintenance-free offering years of trouble free operation and low energy consumption. Vereo™ features a compact rack mount control unit with a front facing operator touch screen control panel. The small form factor marking head makes integration into small spaces easy. A built-in focus finder system helps to quickly focus the laser for marking. Programming and connectivity is controlled through a simple USB interface to a laptop or desktop PC. Additional features such as external axis control, dedicated I/O, marking on the fly and camera assisted marking makes the Vereo™ a powerful tool for any production process.